Dec. ’09 – Mayor Bloomberg’s Department of Education (DOE) announced the planned closings of 17 public schools. Soon the DOE plans to place many more so-called “failing” public schools on the chopping block. Since 2002, when the mayor was given control of public schools, more than 90 had already been shut down while ignoring the democratic voice and opposition of parents, community, students and school staff. 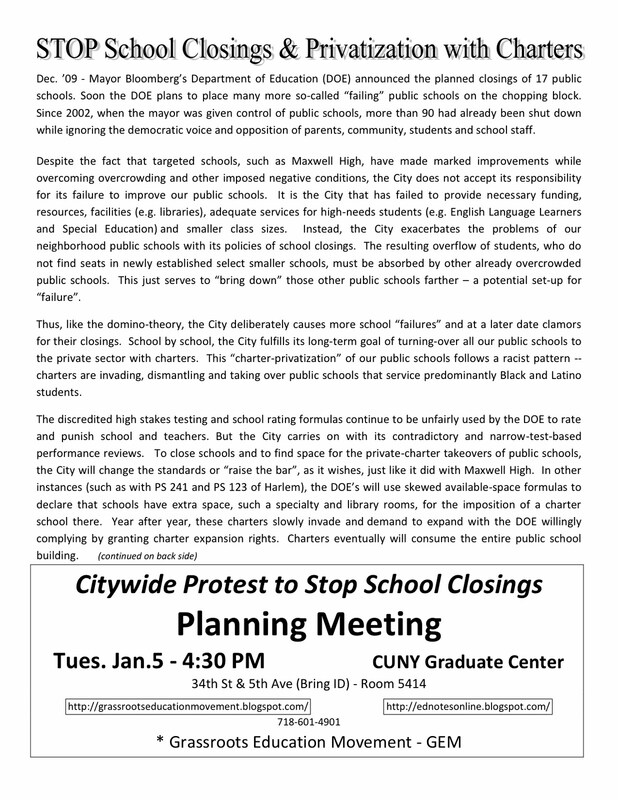 Despite the fact that targeted schools, such as Maxwell High, have made marked improvements while overcoming overcrowding and other imposed negative conditions, the City does not accept its responsibility for its failure to improve our public schools. It is the City that has failed to provide necessary funding, resources, facilities (e.g. libraries), adequate services for high-needs students (e.g. English Language Learners and Special Education) and smaller class sizes. Instead, the City exacerbates the problems of our neighborhood public schools with its policies of school closings. The resulting overflow of students, who do not find seats in n ewly established select smaller schools, must be absorbed by other already overcrowded public schools. This just serves to “bring down” those other public schools farther – a potential set-up for “failure”. Thus, like the domino-theory, the City deliberately causes more school “failures” and at a later date clamors for their closings. School by school, the City fulfills its long-term goal of turning-over all our public schools to the private sector with charters. This “charter-privatization” of our public schools follows a racist pattern — charters are invading, dismantling and taking over public schools that service predominantly Black and Latino students. The discredited high stakes testing and school rating formulas continue to be unfairly used by the DOE to rate and punish school and teachers. But the City carries on with its contradictory and narrow-test-based performance reviews. To close schools and to find space for the private-charter takeovers of public schools, the City will change the standards or “raise the bar”, as it wishes, just like it did with Maxwell High. In other instances (such as with PS 15K in Red Hook and PS 241 and PS 123 of Harlem), the DOE will use skewed available-space formulas to declare that schools have extra space, such a specialty and library rooms, for the imposition of a charter school there. Year after year, these charters slowly invade and demand to expand with the DOE willingly complying by granting charter expansion rights. Charters eventually will consume the entire public school building. The City, with it flawed school-closings policies, deflects its blame in this “school failure” and viciously, with media hype, blames teachers AND THE TEACHER UNION for the school’s problems. The City continues to trash our valued neighborhood public schools along with important long established school-community support networks and traditions. With school closings, many educators (especially the more skilled, experienced and higher paid) are threatened with losing their permanent placements and are forced into the costly (over $80 million yearly) pool of unassigned teachers (i.e. ATRs). Thus, students lose the talents of seasoned teachers only to be replaced by less experienced and cheaper teachers. Students often lose the vital programs, such as orchestra, drama and team sports, which only larger schools can provide. With school closings and the imposition of private charters, our community, parents and teachers lose their right to democratic input into their schools. Charter schools are managed by private boards that have ultimate control. Most unfairly have no school worker unions and thus save costs by providing less in pensions, wages, compensation, benefits and worker rights. These economic factors along with inordinate demands and workloads result in the high turnover rate of charter school staff. 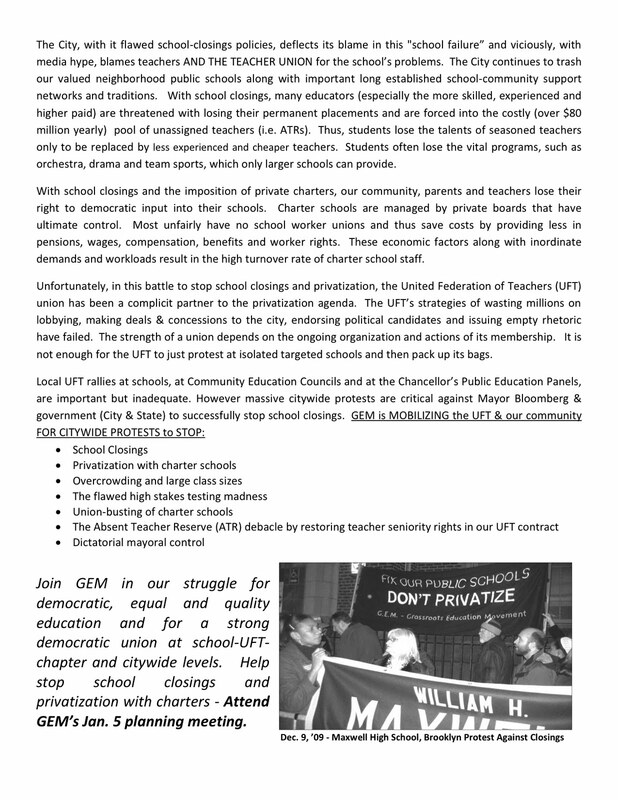 Unfortunately, in this battle to stop school closings and privatization, the United Federation of Teachers (UFT) union has been a complicit partner to the privatization agenda. The UFT’s strategies of wasting millions on lobbying, making deals & concessions to the city, endorsing political candidates and issuing empty rhetoric have failed. The strength of a union depends on the ongoing organization and actions of its membership. It is not enough for the UFT to just protest at isolated targeted schools and then pack up its bags. Attend GEM’s Jan. 5 planning meeting. « Jamaica High School Represents! 700 Rally to Protest Closing!